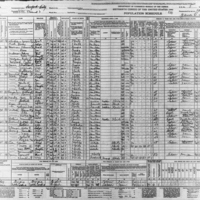 The Census population schedule for Precinct 3, Sanford in 1940. Individuals are identified by name, titles and terms, gender, age, marital status, race, relationship to head of household, birthplace, birth year, the last place of residence, and occupation. A notable resident listed in this record was James Walter Grady (1924-1945), who appears on row 15. A resident of Sanford, Florida, Grady was a private in the U.S. Army during World War II. He died during his service in France and is currently buried at the Epinal American Cemetery and Memorial in Dinozé, France. Grady is one of 85 Florida residents interned at Epinal. Grady was born to Meothel Grady and unknown mother. He worked as a farmhand in the Sanford area prior to his enlistment into the Army on September 1, 1943. Because he was an African American, Grady was assigned to a segregated unit of the 3126th Quartermaster Service Company. Prior to their deployment in France, the 3126th was stationed at Maindy Barracks in Cardiff, Wales. Grady died in France on April 5, 1945. 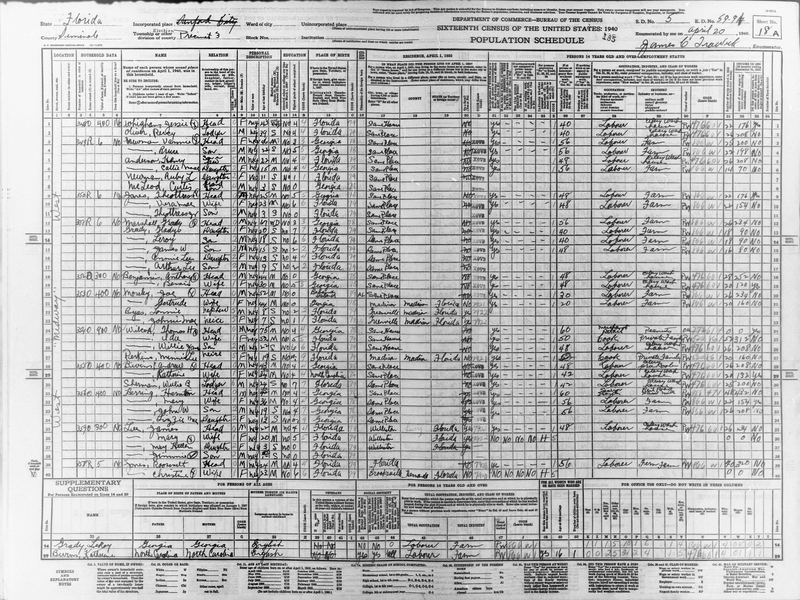 Digital reproduction of original census record by James Trawuk, April 20, 1940. Originally created by James Trawuk and published by the Bureau of the Census. "James W Grady." FamilySearch. https://familysearch.org/ark:/61903/1:1:VTCY-WJF. "Pvt James W Grady." Find A Grave. http://www.findagrave.com/cgi-bin/fg.cgi?page=gr&GSln=grady&GSfn=james&GSmn=w&GSbyrel=all&GSdyrel=all&GScntry=7&GSob=n&GRid=56372634&df=all&. "Electronic Army Serial Number Merged File, ca. 1938 - 1946 (Enlistment Records)." U.S. National Archives and Records Administration. https://aad.archives.gov/aad/record-detail.jsp?dt=893&mtch=1&cat=WR26&tf=F&q=33797354&bc=,sl,sd&rpp=10&pg=1&rid=4253151 (accessed October 12, 2015). "Army Honor List of Dead and Missing Personnel." Genealogy Trails History Group. http://genealogytrails.com/fla/seminole/ww2honordead.html (accessed October 27, 2015). "James Walter Grady." FamilySearch. https://familysearch.org/ark:/61903/1:1:MNNR-6X9 (accessed October 13, 2015). Trawuk, James. “Sixteenth Census Population Schedule for Election Precinct 3, Sanford.” RICHES of Central Florida accessed April 22, 2019, https://richesmi.cah.ucf.edu/omeka/items/show/6533.